Recently one of our team members was looking for a new apartment and after returning a community she visited over lunch she told us about her experience. She was given the option of a unit with Formica countertops and laminate flooring and new carpet that had not undergone their remodel for $1150 or one of the newly remodeled units with granite countertops and tile floors for $1300. She said neither had any newer or fancier appliances the only difference was the countertop and flooring. After listening to her dilemma we set off to do some investigating so we could share what we found with you. Should you upgrade your countertops in your rental home? There are a few questions you should ask yourself. First, is it time? Perhaps you have recently purchases a home and decide that kitchen remodeling is necessary to make the home a profitable rental. If that is the case then you may want to consider granite over Formica. Second, where is it located? Is it in an area where people expect upgraded features like granite? If you needed to sell the home would the buyers expect that sort of upgrade? Lastly, is the property in the top 75 percentile of rents for comparable properties? If so, you may want to consider upgrading. This recommendation comes from Ben Leybovich, a real estate investor and author. What that means is if the range of a three bedroom rental is from $1200 – $1700 in your area; make sure your property rents for at least $1575 before considering upgrading to granite. What are the benefits to remodeling a kitchen with granite? 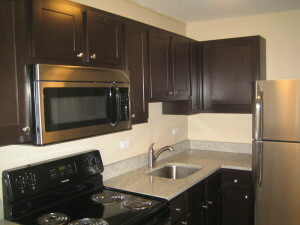 With granite countertops you can charge more rent. Most apartments are charging more for properties that have been remodeled with granite. If you put granite as an upgrade in the kitchens and bathrooms, you can likely charge anywhere from $25 – $100 more per month for rent. A second benefit is the durability of granite over Formica. If a renter sets a hot pan on a Formica countertop you will typically have to replace the whole kitchen again. Not only is it a hassle but you’ll also have increased down time where the property cannot be rented as you replace the countertops. Because granite countertops are more durable you are much less likely to need more than a resealing in between tenants. If it’s time to do some kitchen remodeling in your rental property, let Modlich Stoneworks help you decide if it is a good investment. We’ll be happy to talk with you about your situation either in our showroom at 2255 Harper Road or on the phone – 614-859-6596.